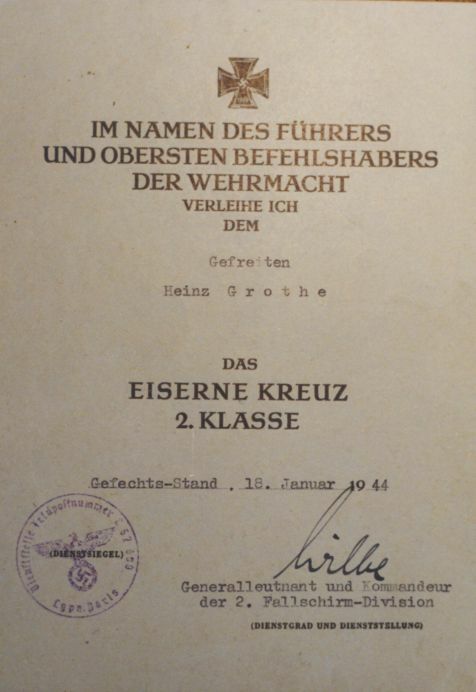 As requested here is the EK II award document from Wunsch. If you can see its a real early award and field made. 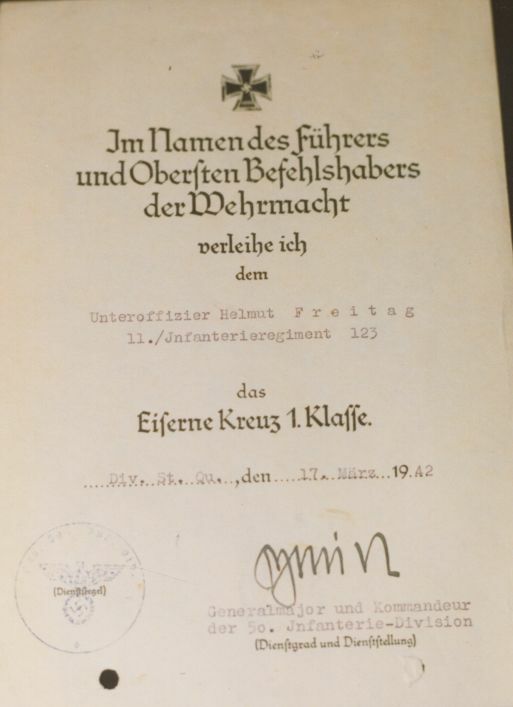 It is signed from Wolfram Freiherr von Richthofen. 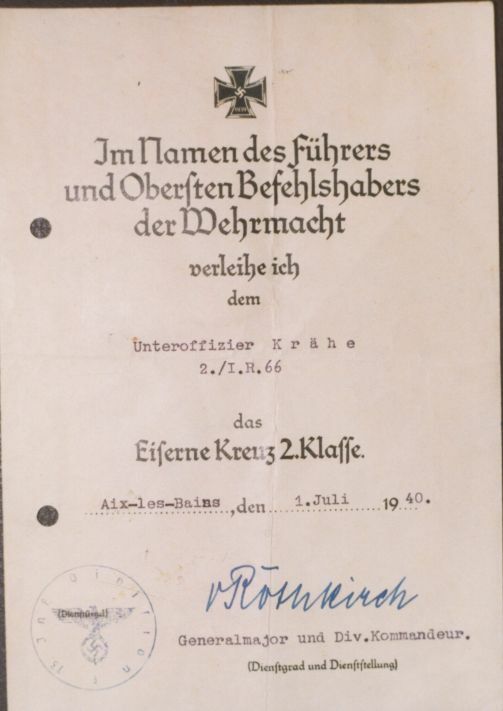 Let?s see your Fallschirmtruppe EK2 award documents. 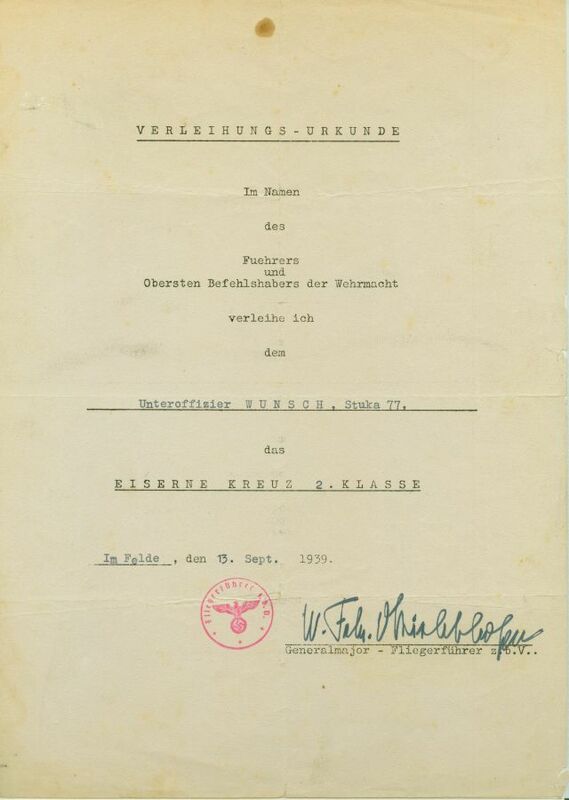 To kick things off, here is a classic Fall Gelb document, issued in the Hague and signed by Generalmajor Putzier, who took temporary command of 7. 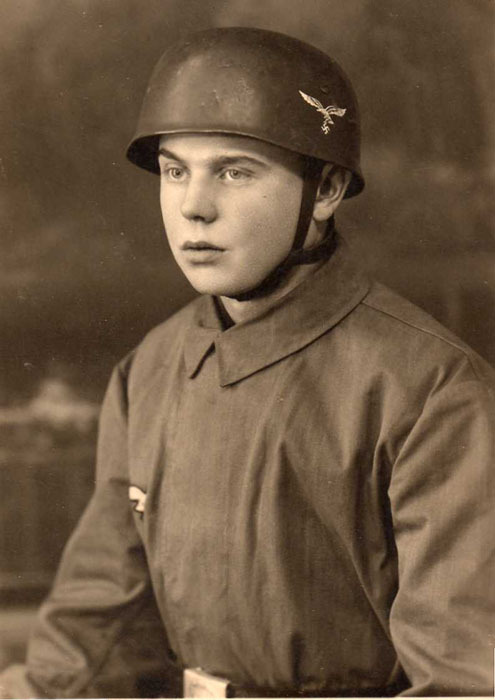 Fliegerkorps after General Student took an accidental bullet in the head from a nervous SS-VT soldier who happened to be passing and took a potshot when Student looked out the window of his command post. 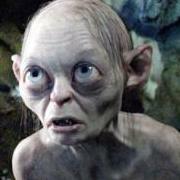 Martin K?hne, who died quite recently, was born in 1918 and had what used to be known as ?a good war?. Oberfahnrich K?hne came to Fallschirmj?ger-Regiment 1 from Flak-Rgt 10 in 1939, completing his parachute training at Wittstock. 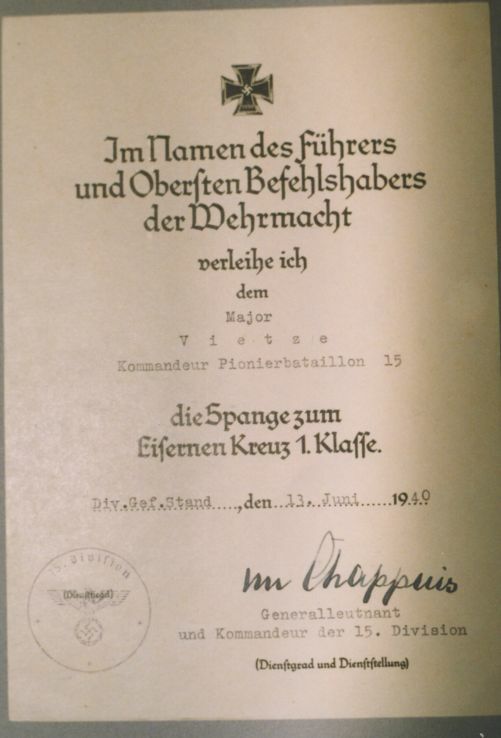 K?hne ended the war as a Major with Fallschirmj?ger-Rgt 10. 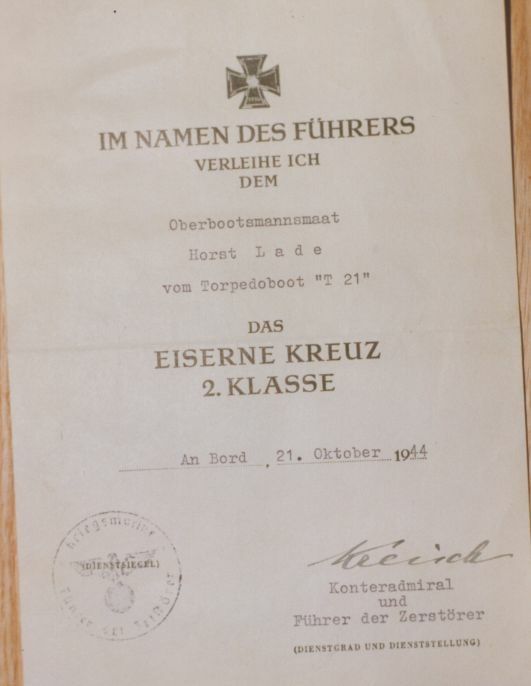 He held the Ritterkreuz, DKiG, Ehrenpokal, EK1, EK2 and VAiS (Black Wound Badge). He fought in Holland, Greece, Crete, Russia, North Africa, Italy and other places in the Mediterranean theatre of operations. 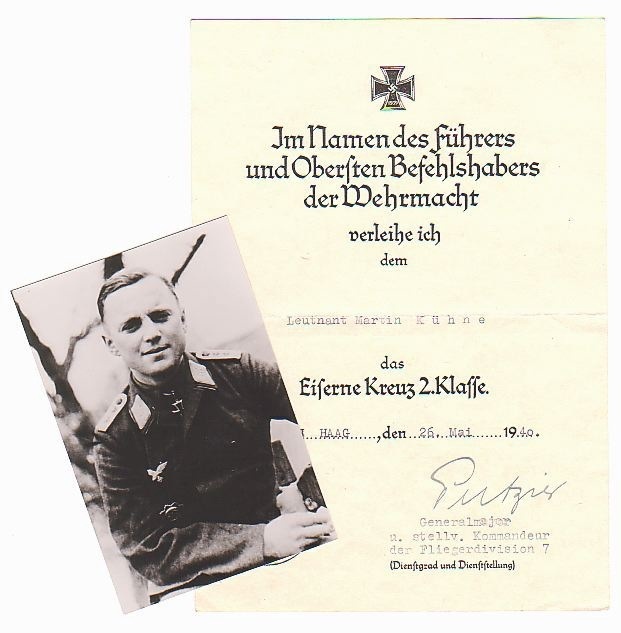 In April 1940, Leutnant K?hne was a Zugf?hrer (Platoon Commander) in 2./Fallschirmj?ger-Erganzungs-Btl 1 at Stendal. This sub-unit was sent to Twede Tol with others to create a reserve from which replacements and reinforcements could move easily by requisitioned vehicles, including bicycles, to the south end of the Moerdijk bridges and North Dordrecht. 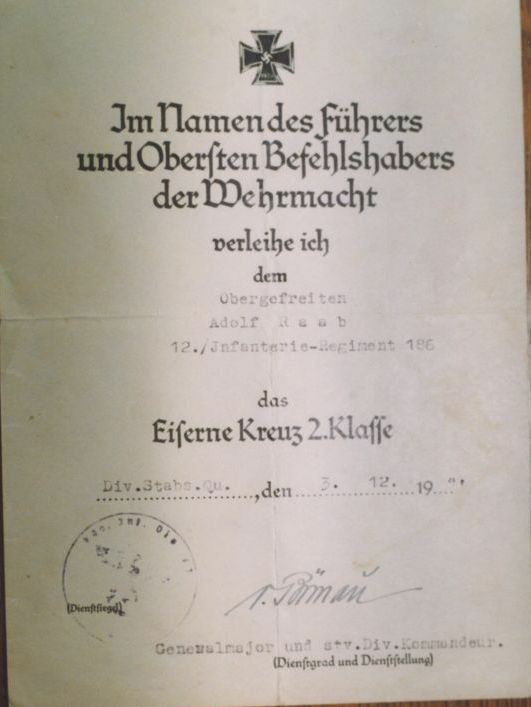 However, he was apparently with 15./FJR1 as a platoon commander for the Moerdijk jump and certainly saw action during the battle, winning this EK2 for leading a successful assault on a heavily defended bunker, an action in which he was wounded. Perhaps someone here can shed more light on this. At Corinth, K?hne and his men captured British anti-aircraft battery and took many prisoners. 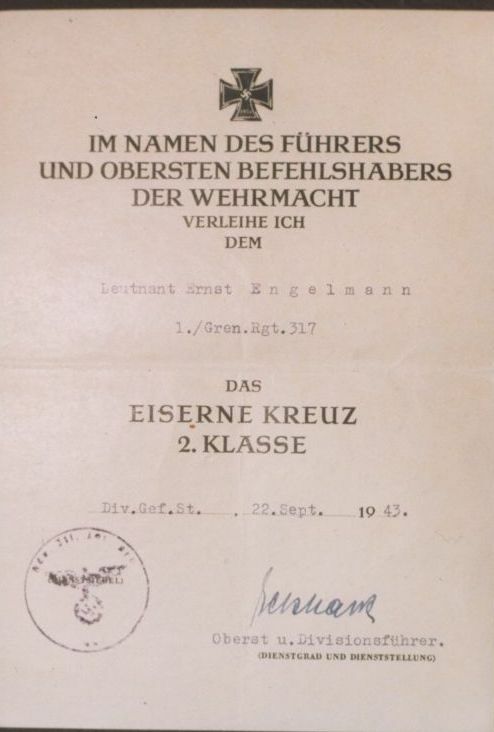 K?hne was recommended for the Ritterkreuz but received the EK1 instead. 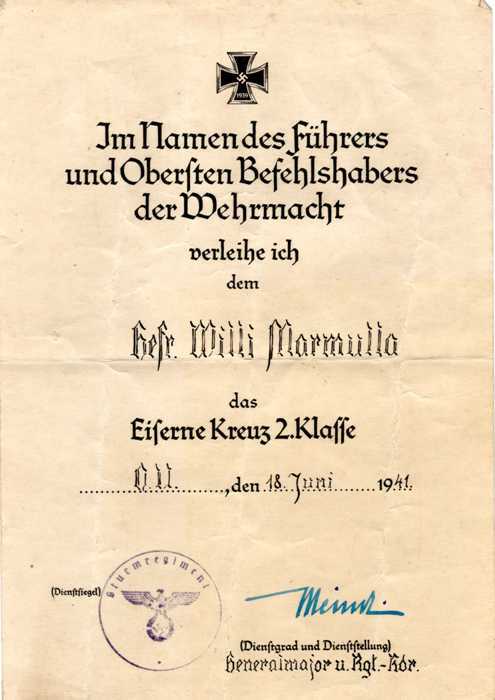 In North Africa, he took part in the Ramckebrigade?s extraordinary two-hundred mile trek from El Alamein back to German lines in November 1942, for which he received the DKiG. He fought at Anzio-Nettuno, Cassino and other places but his finest moment was Fall Leopard, the capture of the Greek island of Leros in November 1943, which brought him the Ritterkreuz. 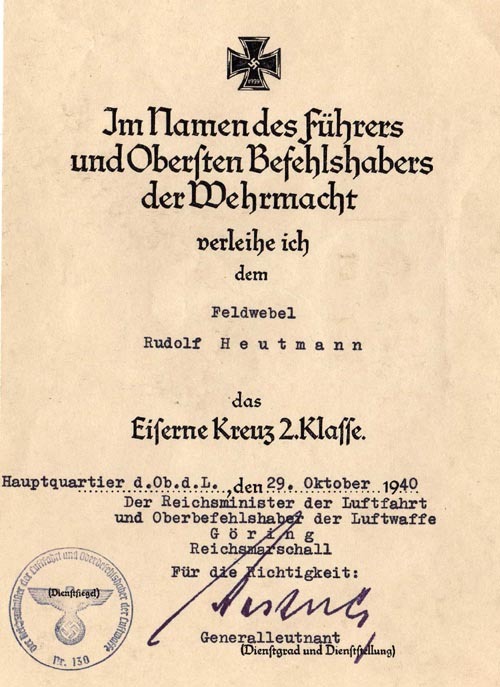 By then, Hauptmann K?hne was CO of I./Fallschirmj?ger-Rgt 2. Leros was defended by an 8550-strong Anglo-Italian force, commanded by the British General Tillney and supported by heavy artillery. The airborne element of the attacking force comprised elements of I./FJR2, 15. 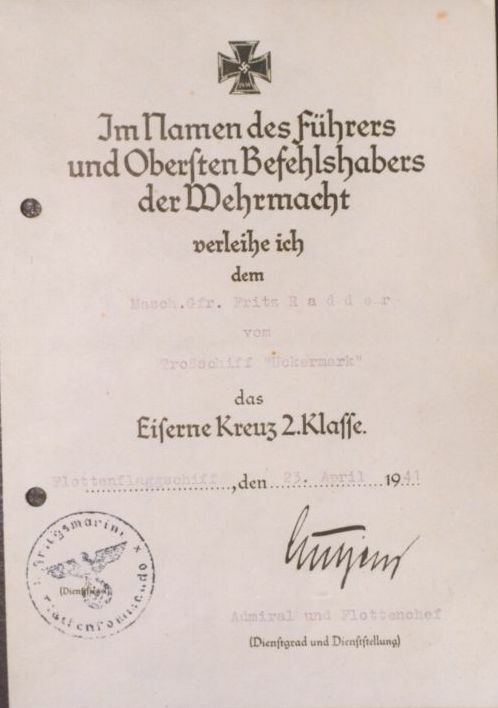 (Fallschirm) Kompanie and elements of 22. Luftlande-Division. 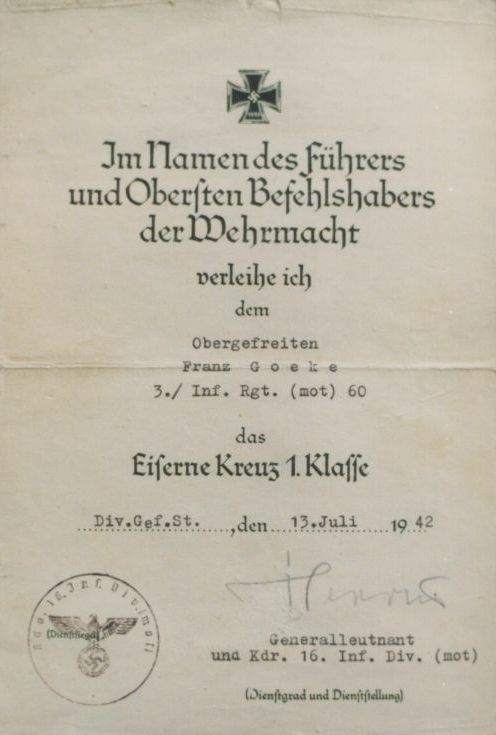 The seaborne element consisted of the Brandenburg Division?s III./Leichtes-Infanterie-Rgt, assisted by Brandenburger K?stenj?ger-Abteilung (Coastal Raiders) commandos. 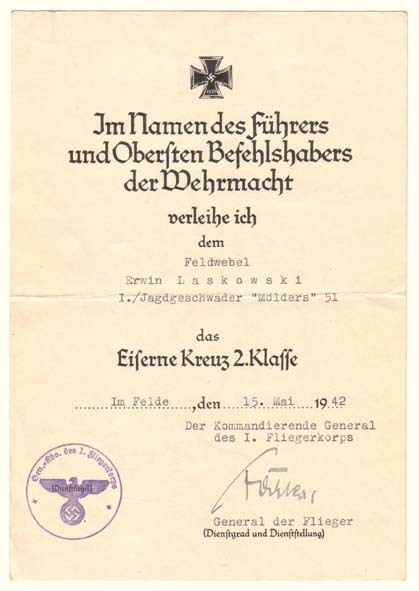 Just after 1300 hrs on 12.11.1943, 2. and 4./FJR2 jumped with the Brandenburg Division?s 15. (Fallschirm) Kompanie and moved quickly off the DZ to capture Monte Rachi, one of the highest points on Leros. 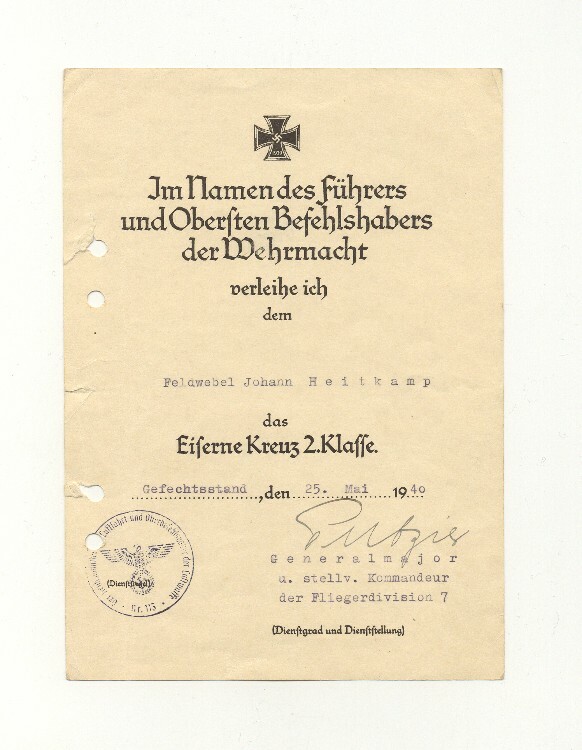 Once the Fallschirmj?ger had driven a wedge between the defending forces in the north and south by the afternoon of 13.11.1943, the rest of I./FJR2 jumped as other reinforcements were arriving by sea. However, the defenders were resisting ferociously and victory was by no means a certainty for the Germans. On 14.11.1943, supported by Stukas, the Fallschirmj?ger mounted an assault on the British HQ on Monte Meroviglia but were beaten off and had to fall back to their positions on Monte Rachi. The next day, K?hne pulled his paras from their shellscrapes and shallow trenches and they stormed Monte Meroviglia, routing the defenders. 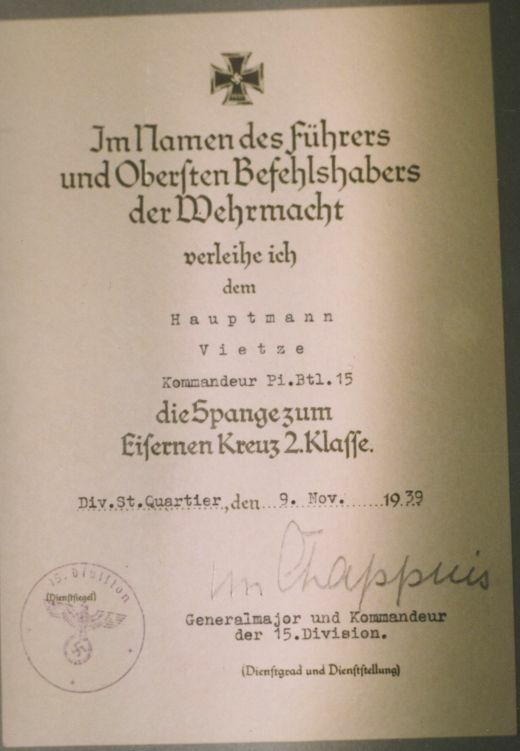 On 16.11.1943, Leutnant Max Wandrey, commanding the Brandenburg paras, captured General Tillney. By nightfall on 18.11.1943, all Allied forces on Leros had surrendered. 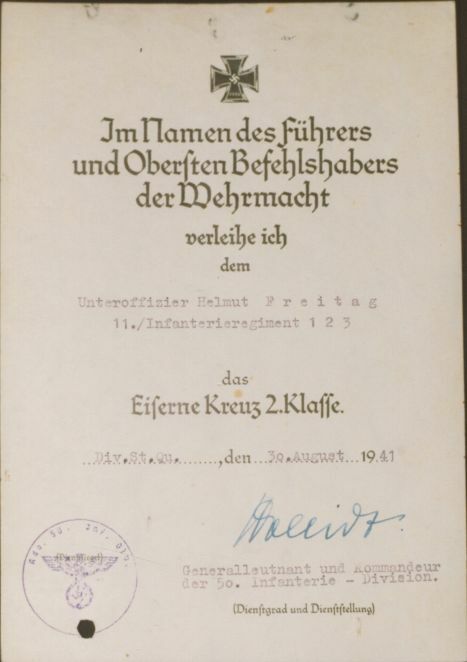 This document was reportedly given to the author Klaus Peters by Martin K?hne as a present when Peters was researching his two-volume photo-history of Fallschirmj?ger-Regiment 3. 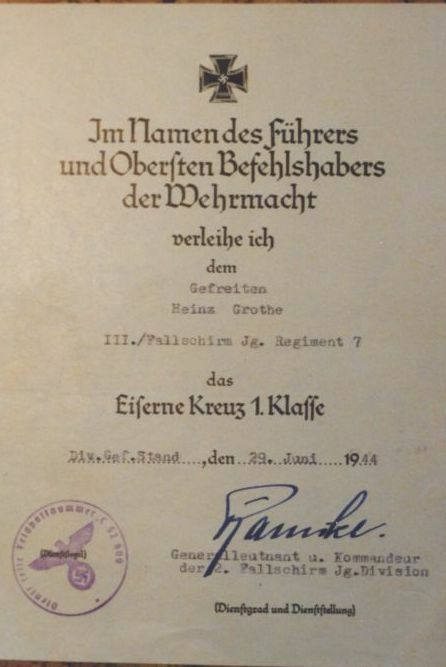 The document was acquired by George Petersen who later sold it to Robert Queenm from whom I bought it, thanks to my friend Eric Queen, author of Red Shines The Sun, the definitive reference book on the Heer's Fallschirm-Infanterie-Kompanie/Bataillon, many former members of which formed the cadre of FJR3 via II./FJR1. 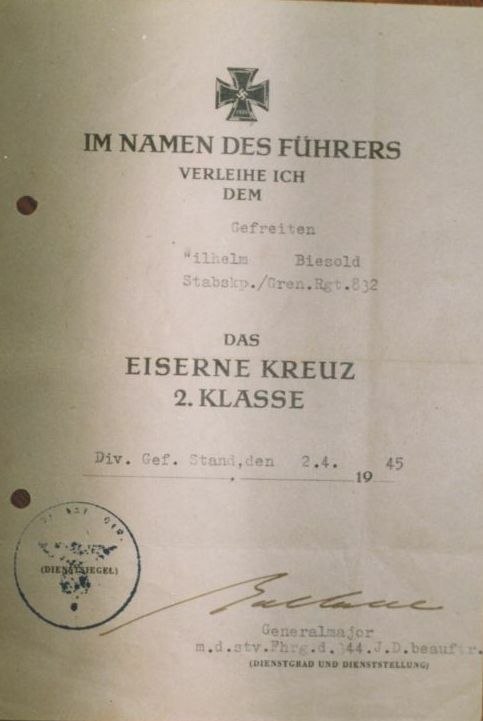 I believe the rest of Martin K?hne's documents remain with his family, including the formal Ritterkreuz document, K?hne being one of the relatively few to receive a formal document at that stage of the war. Here's one I have, also signed by Putzier - Part of a much larger grouping. I think you'll recognize this one PK. 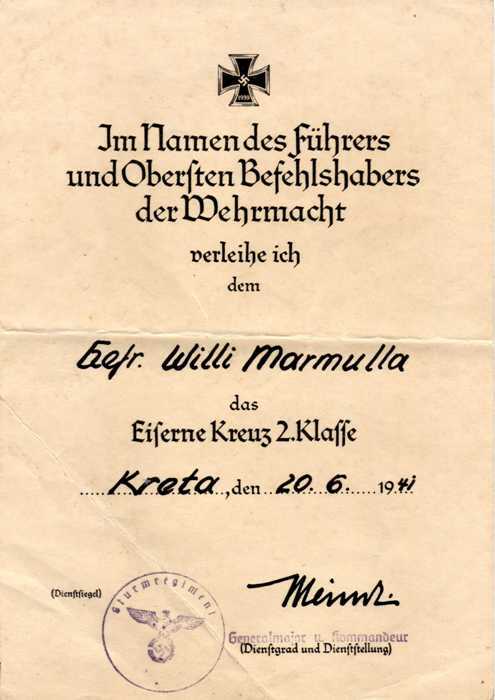 Here are two for the same guy Gefr Willi Marmulla who was with the Luftlande Sturm Regiment when they dropped on Crete. With members of what I believe to be 11 Kompanie 3rd Battalion of the Luftlande Sturm Regiment. 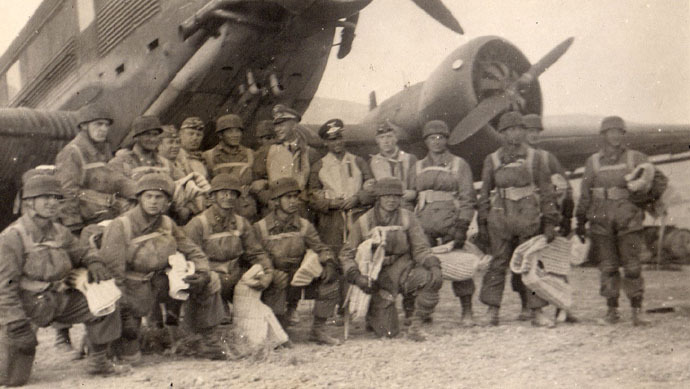 The FJ standing to the left of the aircrew who has his head turned is identified on the back as Oberleutnant Jung. Any other info would be greatly received. Tasty docs, Simon! Yes, I remember that Heitkamp EK2 document. 13./LLSR landed just south of Maleme aerodrome. They also fought in Canea. The chap to ask would be Jean-Yves Nasse. add yours and maybe this can be an instant database chapter.